Floor plan of Pentonville prison, 1840s. Design by Joshua Jebb. Illustrator unknown. A rare opportunity is afforded me to try my hand as a sketch artist for a rehearsal session of the London Shakespeare Workout programme directed by Dr. Bruce Wall, where I aim to capture some of the live performers as they practice their craft in a most unexpected venue in London. Three more actors arrive, two whose names I can’t quite hear over the musicians testing the newest phrase, the first tall and well-met with the easy smile full of welcome, the second whose spirit, unlike the others, is a carefully guarded mask. Still I’m not convinced by the tough-guy-i-don’t-care exterior, who pretends to be here for a change of pace – I can feel the gusto with which he gathers his why-not in a fist to shout in chorus “I’m free!” …and Daniel, a spark about to ignite… and I saw it happen when he became an old man, palsied and stumbling, unable to speak…around him courage swelled and defied all weakness, to help him raise his hand, grasping an imaginary torch that we all could see. And he is a hero. 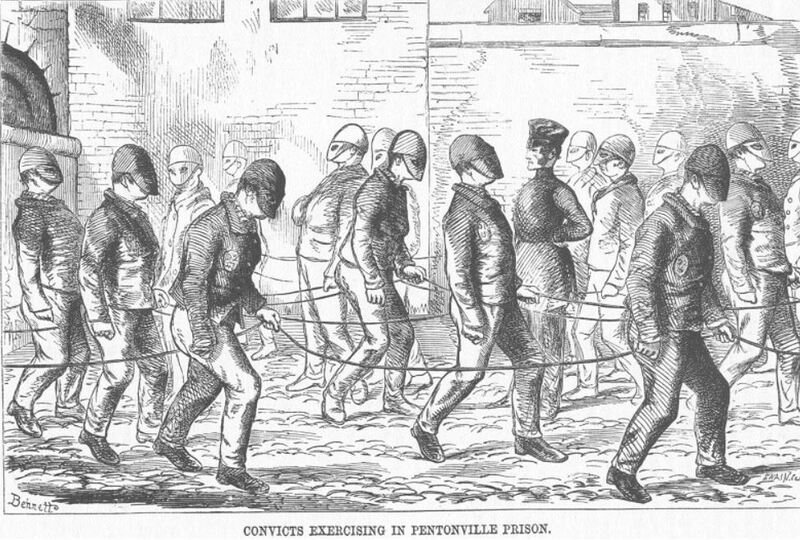 Convicts exercising in Pentonville prison, 1840s. Illustrator noted lower left, Behrett. That first year, over 1,000 inmates, 147 prison officers, and over 600 professional actors took part in LSW at HMP Woodhill, (a category A prison near Milton Keynes), soon followed by other UK prisons, then overseen educationally by Milton Keynes College. to utilise the language of Shakespeare as a tool; a stepping stone to change through effective interaction …[where] within (and formerly without) the prison, the glory and the power of Shakespeare’s language… is something that the prison residents can suddenly find for themselves; something they can share, and, most importantly, something which they can own. In celebration of LSW’s 20th Anniversary Year in 2017, LSW started the “Linked Up Initiative” to embark on further creative collaborations aspiring to provide the opportunity for every UK drama student to engage in LSW Prison Project, as “a vital part of their training as our future key communicators“. 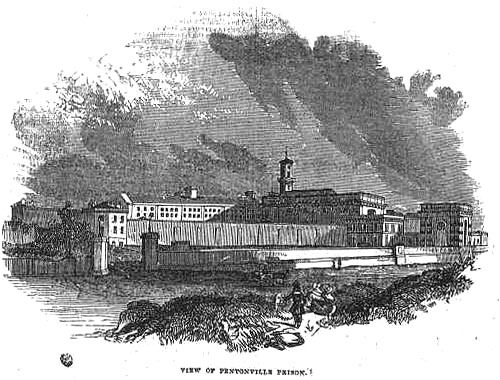 View of Pentonville prison, 1840s. Illustrator unknown. Find out about London Shakespeare Workout productions and the mission of LSW Prison Projects – Founded in 1997, LSW aims, through study of Shakespeare, to foster self-discovery, confidence, creativity, and access to arts/education, which many prison residents may have found inaccessible prior to joining the programme.